Driving map to Long Live the Kings charter location and lodging. Commercial airlines fly daily to Kenai Airport (ENA) or Anchorage Ted Steven International Airport (ANC). A rental car is a necessity. Rental cars are available at both locations. It is a 15 minute drive from Kenai or a 2.5 hour scenic drive from Anchorage to Long Live the Kings, on paved roads. If it is your first trip, we recommend enjoying the drive from Anchorage. Watch for wildlife, and remember, during summertime in Alaska the sun rarely sets. There are several fish processors available to vacuum pack, freeze and store your fish while you are visiting. Your fish processor will also be glad to smoke or make your fish into a number of other custom products. They can also ship your fish home for you if you choose to do so. If you choose to get a fish mounted, we will contact a taxidermist to meet you at our docks to begin the process. Some of our local taxidermists are world renown for their salmon, trout, or halibut trophies. Fish with a guide or KRSA member that has registered with the KRSA Release a Hog -- Take Home a Trophy program. Document your "catch and release" in accordance with the program rules. KRSA will reimburse you for $800 toward the cost of a full size reproduction mount. 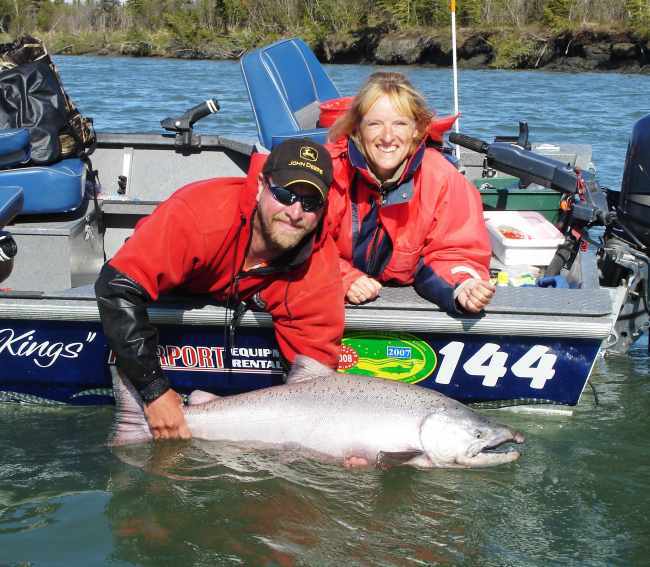 Hang your trophy Kenai River king salmon on your wall!